Adopt a real manatee or renew your membership. 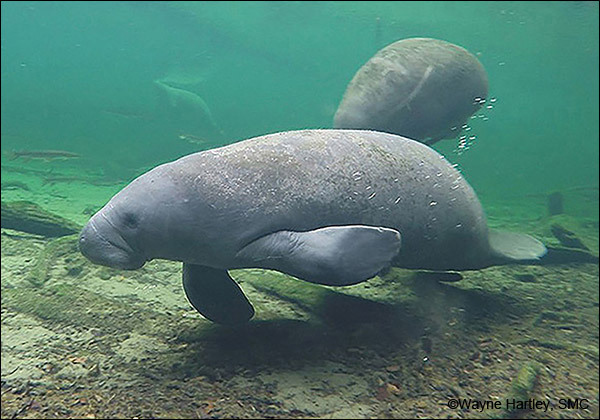 Funds from the Club’s Adopt-A-Manatee program go toward efforts to help protect manatees and their habitat. Unlike other animal adoption programs, the manatees in our adoption programs are real, living manatees with known histories. 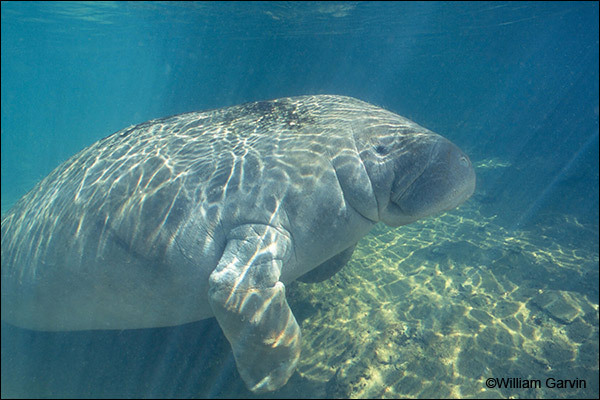 To see the manatees in the adoption program, click the blue “Choose a Manatee” box below. 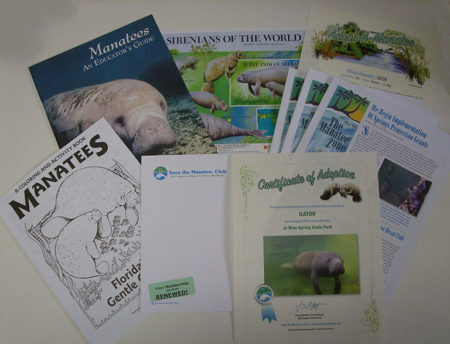 An adoption certificate with full-color photo and a biography of a real Florida manatee. 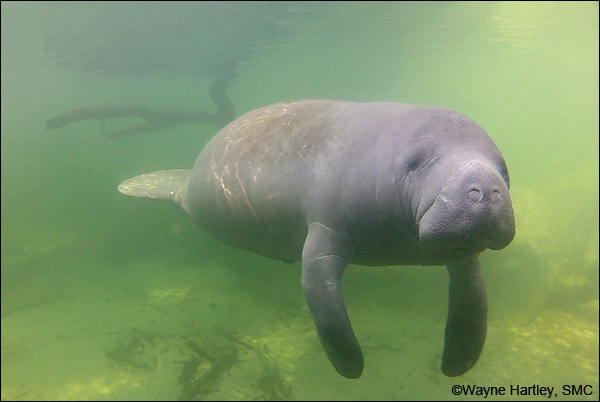 The Manatee Zone, our official Club newsletter, featuring updates on the adopted manatees. Paddle Tales, our eNewsletter (when an email address is provided). Free shipping for U.S. adoption orders. 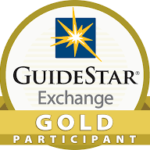 A free Membership Gift is included with memberships at the Friend Level or above. Adopt At $35 Or More and Get A Free Ornament! 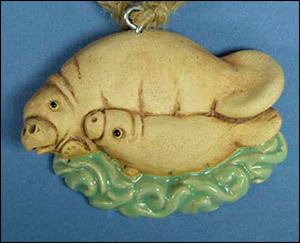 For a limited time, when you Adopt-A-Manatee at $35 or more, you’ll receive a free individually handcrafted manatee mother and calf ornament. Order by May 2nd for Mother’s Day delivery in the U.S.
Join or Renew - It's Easy! 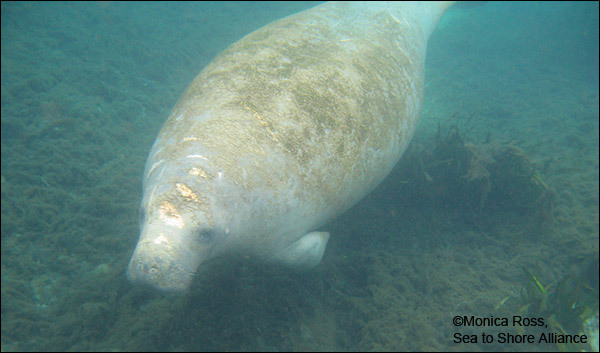 Select a manatee below from the adoption program (note: the manatee’s name and description is below their photo). You can click their name to adopt them online. Whichever manatee you choose, adopting one helps them all! ANNIE was rescued as an orphaned calf and was released in 2008. She is not shy and is quite popular with park visitors. Annie has been known to visit Blue Spring State Park in the winter. AQUA was first sighted at Blue Spring in December 2011 and has been a regular winter visitor since that time. She is identified by the scars on her left shoulder and has had two known calves. ARIEL was just two weeks old when she was rescued with her mom Amanda. She lives at the Ellie Schiller Homosassa Springs Wildlife State Park. 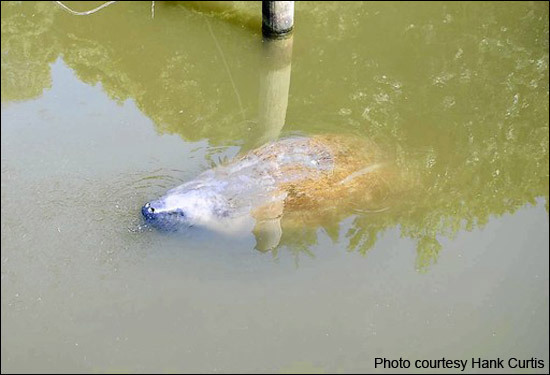 She is a regular at the manatee education programs, lifting her head out of the water to “smile” at the visitors. 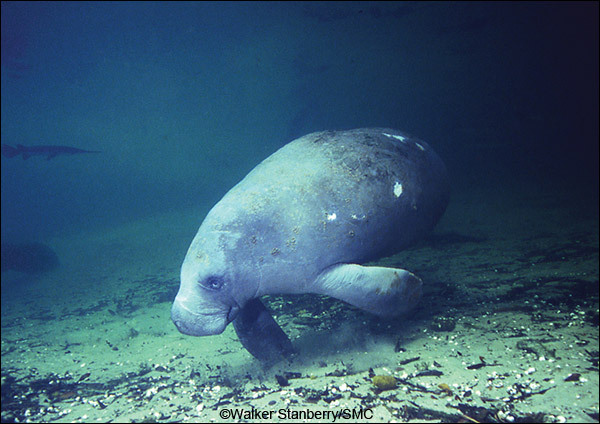 BAMA made history in September 2009 when she became the first manatee ever captured and tagged in Alabama waters by Dauphin Island Sea Lab’s Manatee Sighting Network. Now a local attraction in Mobile Bay in the spring and summer, Bama has migrated from Alabama to Crystal River, Florida each winter. 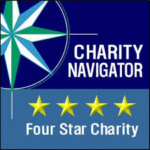 Learn more about outreach in Alabama. 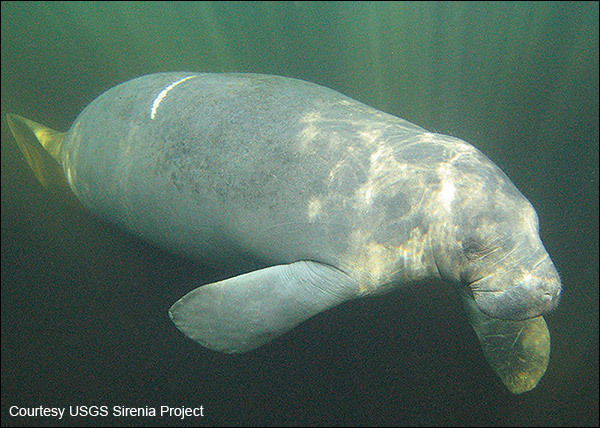 BRUTUS is one of Blue Spring’s largest manatees. He weighs in at almost 1,800 pounds and has been a regular winter visitor since 1970. CHESSIE was first sighted in the Chesapeake Bay in Maryland in July of 1994. This rare manatee sighting created quite a stir. By October of that year, after it was determined that he was not going to head south on his own, Chessie was rescued and flown back to Florida so he wouldn’t die from cold stress. Chessie has been known to travel along the east coast of Florida and the southeastern coast of the U.S. DEEP DENT is a medium-sized male who first showed up at Blue Spring State Park in 1979. He has a deep, “dent-like,” propeller wound on his tail. DOC has returned to Blue Spring State Park nearly every winter since 1976. He is an adult male, nearly 10 feet in length. 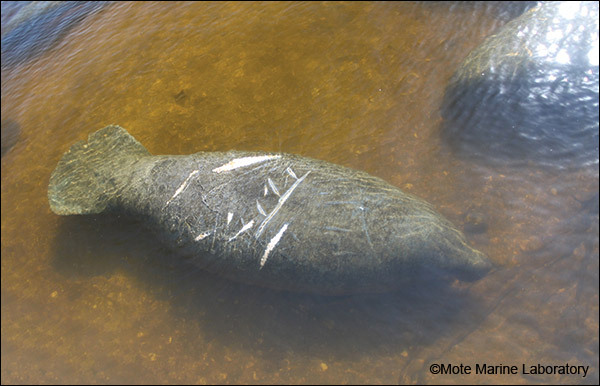 Doc is one of the few manatees frequently spotted in the spring in the summer. ELAINE became Blue Spring State Park’s third female to calve at the age of five, during the 1990-1991 season. She has been known to get into her fair share of mischief! ELECTRA was rescued in 1998 after suffering trauma from a boat strike and entanglement in a crab trap. She is the smallest manatee living at the Ellie Schiller Homosassa Springs Wildlife State Park, and she is also the youngest. But in spite of her size, park staff say that Electra is spunky and likes to follow her own path. ELSIE is easily identified because her tail is badly mutilated from an encounter with a boat propeller. She has been seen in the Tampa Bay area and has had at least two calves. Once, Elsie was documented traveling a distance of about 111 miles in about 23 days. 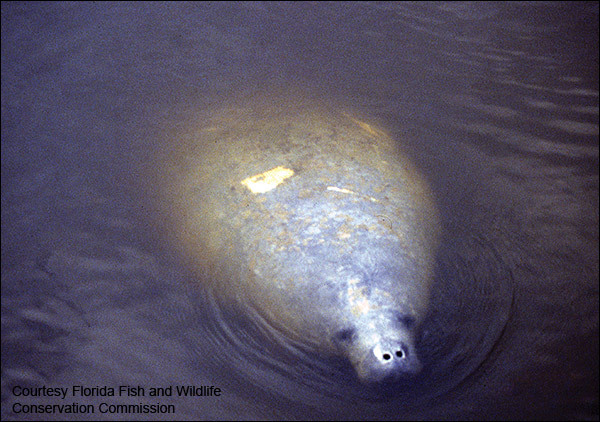 FLASH is a large male manatee first identified in 1977 at Blue Spring State Park. He is shy of human contact and will take off in a “flash” when disturbed. FLICKER is an adult female first documented in 1983 in Ft. Myers. She is named Flicker because she has a series of small propeller scars that reminded researchers of flickering flames. Flicker has been seen at Tampa Electric’s Big Bend power plant in Apollo Beach each winter. FLOYD was born in the summer of 1978. He is easily identified by the park’s rangers because of an old injury that left him with only half a tail. GATOR was first identified in 2011 at Blue Spring State Park. He has been spotted on the webcam chasing and playing with an alligator at the park. That’s how he got his name! 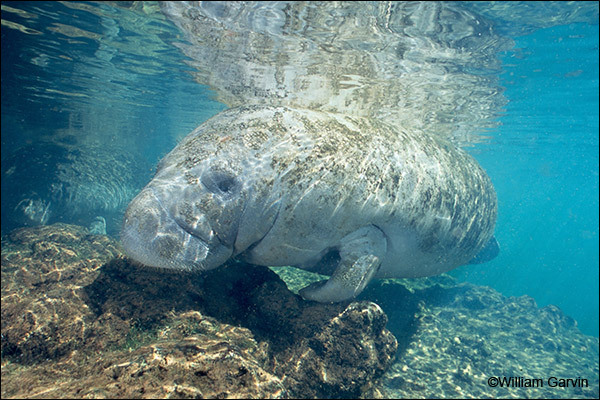 GEORGIA (Memorial Adoption) was a favorite Blue Spring State Park manatee who passed away in 2015. She was a wonderful and caring mother for her own calves and also for orphans in need of care. GINGER frequents the west coast of Florida, south of Tampa Bay. She is known to winter at the FPL plant in Tice, Florida, and she has been seen every summer since 1994 in the Marco Island area. Ginger has two known calves. One of them is named Ale! HOWIE is a sleek, large (1,350-pound) male, known to winter at Blue Spring State Park since 1971. One of Howie’s favorite activities is to tip the research canoe — complete with researchers in it! JEMP was rescued in 1995, after being exposed to red tide. He spent some time in rehabilitation and was released later that year. Jemp is known to frequent the Sarasota and Lemon Bay areas, but he also travels in a wide range along Florida’s west coast. LENNY was born to Luna in 1978 and continues to winter at Blue Spring State Park each year. 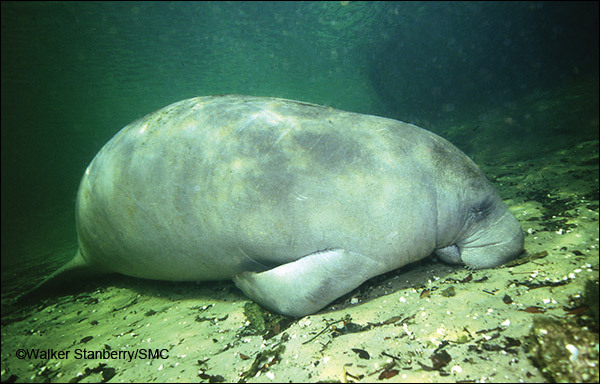 Lenny is the resident “couch potato” manatee, preferring rest to all other activities. LILY is one of the few adult females to regularly winter at the Blue Spring State Park. She has returned each year since 1974 and has at least ten calves. LORELEI (Memorial Adoption) was born in 1975. 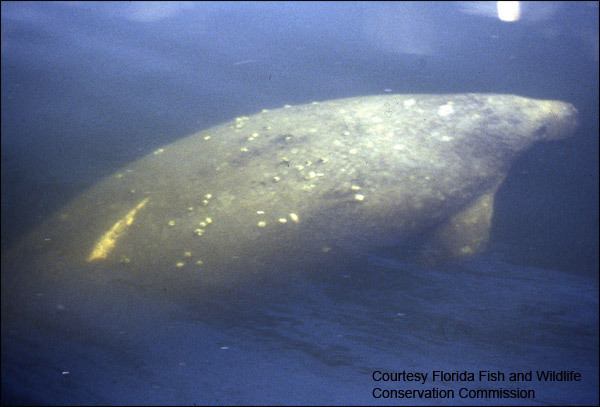 She was the first manatee born and raised in captivity in Florida and was mother to three calves. Lorelei passed away peacefully on April 23, 2018. LUCILLE was born in 1980. Lucille had her first calf at an early age and, in 1993, she became a grandmother. Lucille regularly winters at Blue Spring State Park. 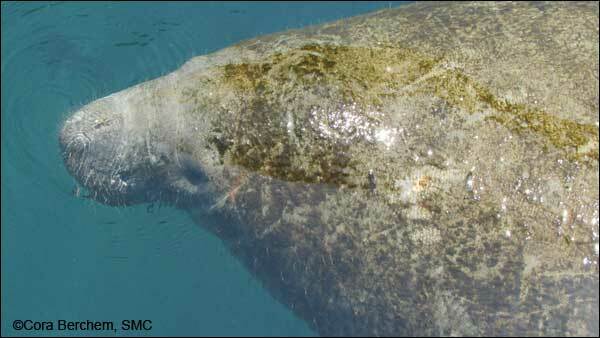 MARGARITO is the son of Lily, another Blue Spring manatee. She brought him to Blue Spring State Park on November 24, 1984, and he has returned every winter since that time. He can be identified by a number of scars from boat hits and a missing flipper. MERLIN has been noted at Blue Spring State Park since 1970, when attendance records first began. His nickname is “Tail-End Charlie” as he often arrives late each year. An adult male, Merlin is over 10 feet in length. 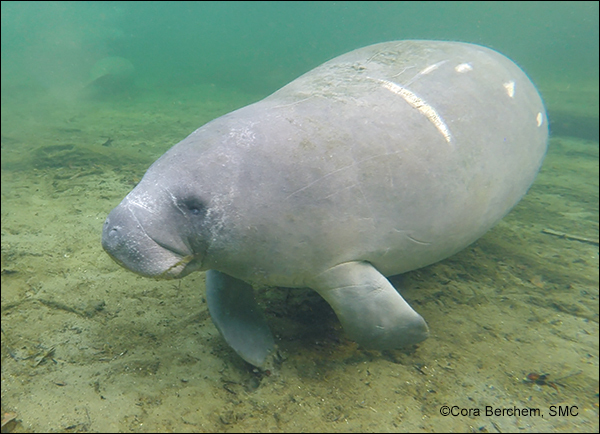 MOO SHOO: A female manatee first identified in 2010, Moo Shoo loves to nudge the research canoe. She has had two calves. NICK is a small adult male who was first identified in 1977 at Blue Spring State Park . His movements have been tracked by radio telemetry, producing information on behavior such as going north, rather than south, in midwinter — hence his nickname, “Crazy Nick. 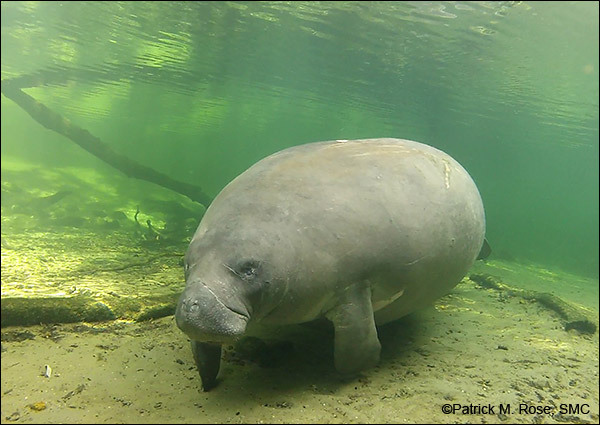 PADDY DOYLE was named by researchers after the famous “fighting Irishman.” He bears the distinction of being one of the fiestiest manatees in the Blue Spring State Park area. PHILIP was born in the summer of 1982. 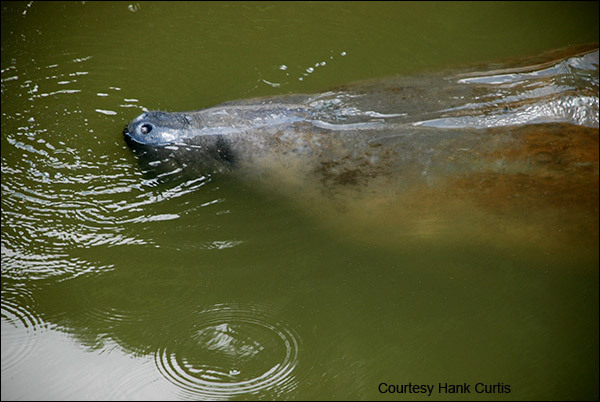 As a youngster, Philip was one of the most playful manatees at Blue Spring State Park. He also seems to love canoes and follows the research canoe everywhere! PHYLLIS is thought to have been born in 1985. 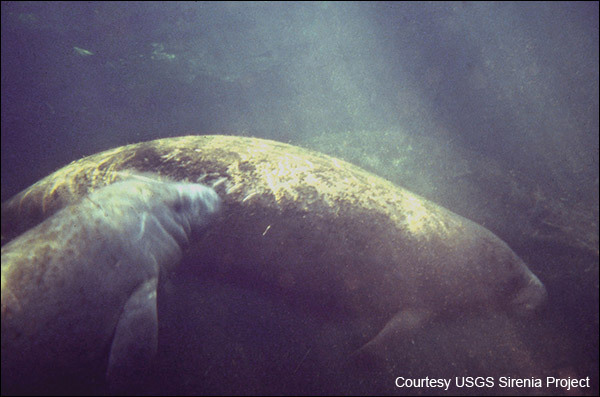 In 1991, Phyllis gave birth to twins — a rare event for manatees. She is now the mother of several calves and a regular winter visitor to Blue Spring State Park. ROBIN is a young male, born to Wonder Woman in April of 1980. 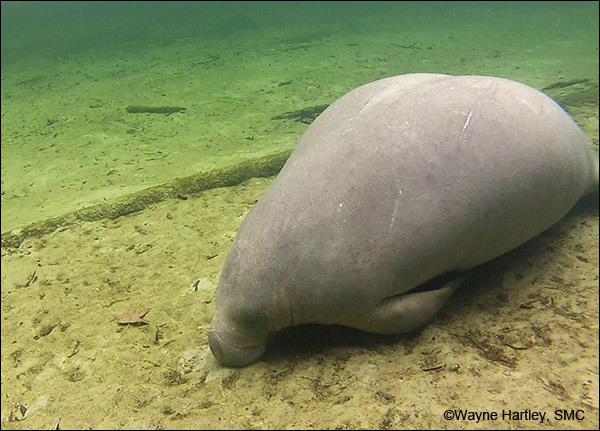 Robin winters at Blue Spring State Park and is one of the few manatees who has a recorded birth date because his mother was being monitored by researchers when he was born. ROCKET is a male manatee, rescued as a tiny orphan in 2006. He was released with Annie at Blue Spring State Park, and they stayed together for over a year. 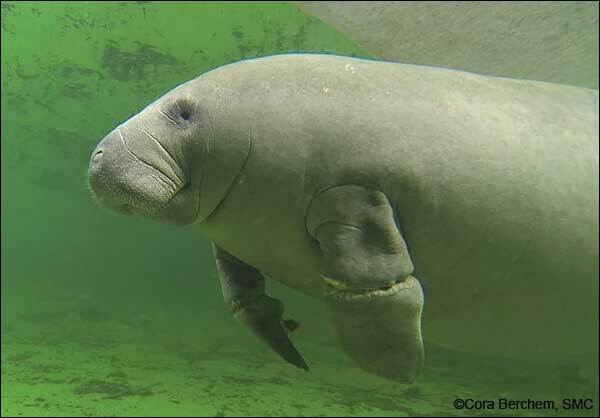 ROSIE (Memorial Adoption) was a favorite manatee who lived at the Ellie Schiller Homosassa Springs Wildlife State Park and passed away in 2015. Rosie was known for being gentle, kind, and maternal. 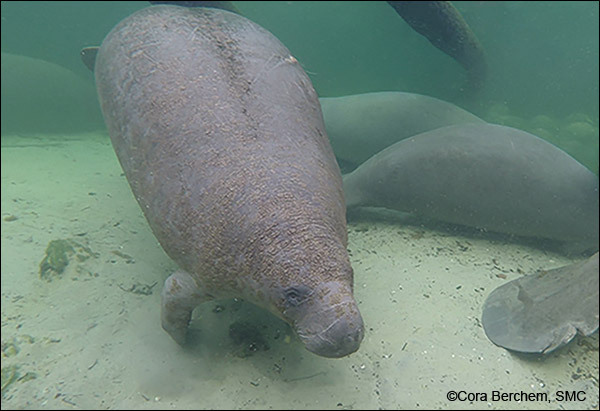 Affectionately called “the matriarch” by the park staff, she served as a surrogate mother to many orphaned or injured manatees who recuperated at the park. SQUEAKY was born at Blue Spring on June 13, 2011. She is the youngest manatee in the adoption program. Please note that Squeaky is currently unavailable for new membership adoptions. Squeaky hasn’t been seen at Blue Spring State Park since 2013. 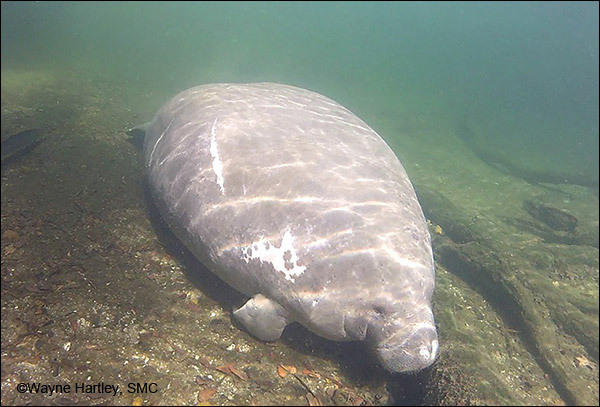 Unlike most manatees, Squeaky did not have significant scars when she joined the adoption program, which makes it difficult to identify her and report on her activity. 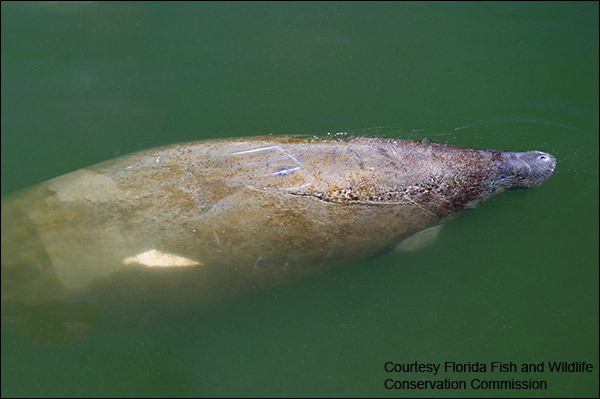 Current adoptive parents of Squeaky may continue to renew her adoption or may choose a new manatee when they renew their membership. 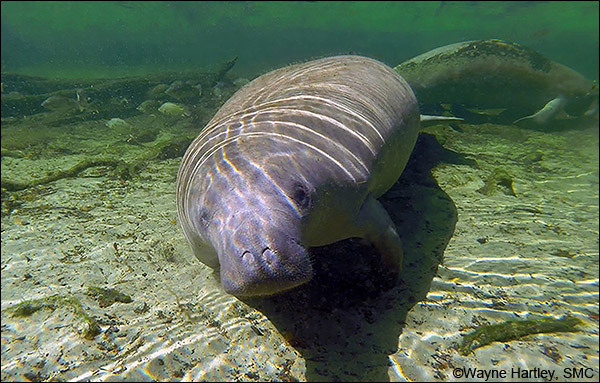 We will keep watching for Squeaky and provide any updates in the Manatee Zone membership newsletter and at our Blue Spring Webcams page at ManaTV.org. UNA was rescued as an orphan in 2003. She was released and gave birth to several calves. 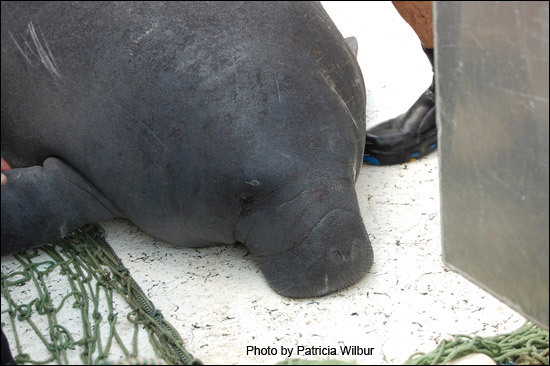 Unfortunately, Una was rescued again because of fishing line entanglement on both flippers. Following treatment, she is once again doing well in the wild. VECTOR is a traveling man(atee) and has been known to frequent the Tampa Bay area and along Florida’s west coast. He has been tracked in Florida as far north as the Suwannee River and as far south as the Peace River. 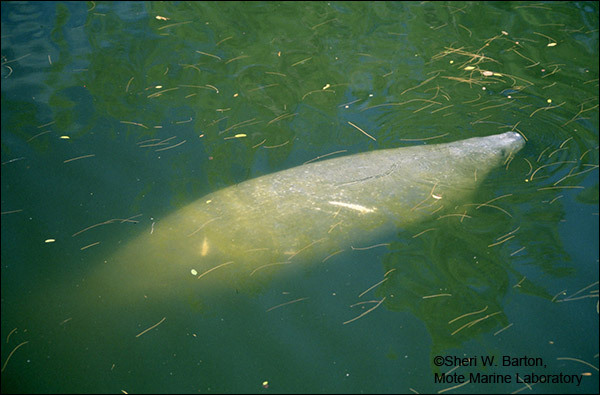 WHISKERS is a male manatee who frequents Blue Spring State Park in the winter. He is the son of Dana, a former Blue Spring adoptee. She introduced him to Blue Spring in 1996, and he has been visiting the park ever since that time. 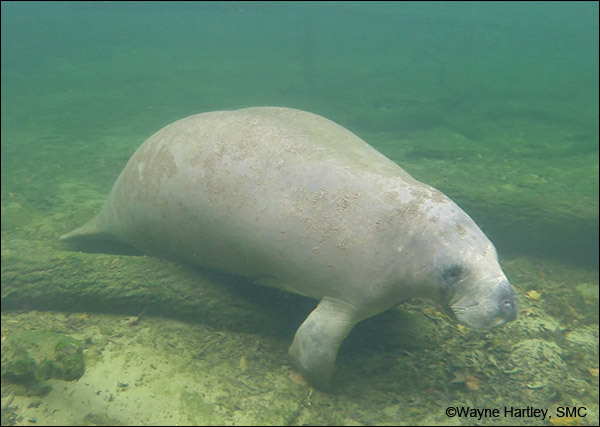 Web: Adopt-A-Manatee or Renew Your Membership online. Phone: Call toll-free within the U.S. 1-800-432-JOIN (5646) or call 407-539-0990 outside the U.S.
Mail or Fax: Print an order form (new members) or print your renewal order form (renewing members). Above, Wayne Hartley, Save the Manatee Club’s Manatee Specialist, takes manatee “roll call” in the morning at Blue Spring State Park. 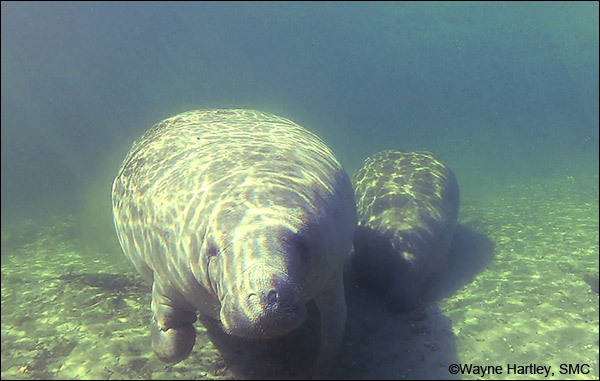 Wayne has over 30 years of experience as a manatee researcher. 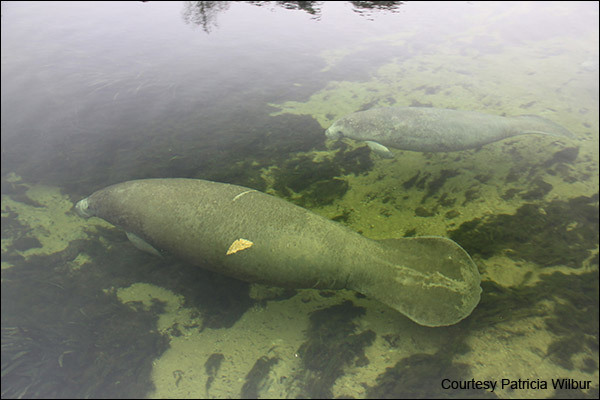 Manatees who regularly winter at Blue Spring State Park near Orange City, Florida, have been chosen as adoptees for one of Save the Manatee Club’s five Adopt-A-Manatee® programs. Blue Spring’s natural spring maintains a year-round temperature of 72 degrees and is an attractive winter refuge for manatees who seek the spring waters when the surrounding river water temperatures become cold. Another Club adoption program is at the Ellie Schiller Homosassa Springs Wildlife State Park in Homosassa, Florida. The park is a rehabilitation facility for manatees who are recovering from injuries before being released back into the wild. Manatees who cannot be released into the wild because of injuries or other life-threatening reasons currently call the park their home. Flicker was named because she has a series of small propeller scars that reminded researchers of flickering flames. She has wintered at the Tampa Electric’s power plant. 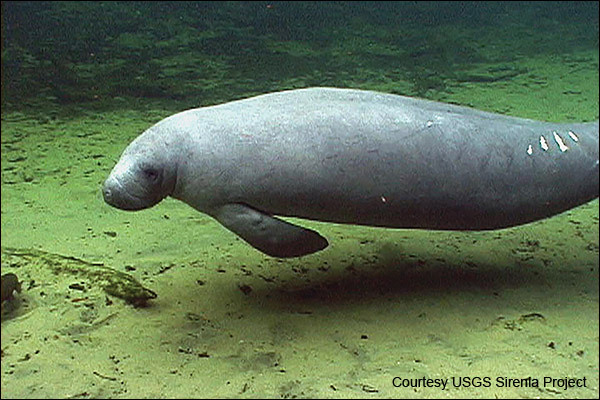 Manatees frequently seen in the Tampa Bay area and along the west coast of Florida are also up for adoption. 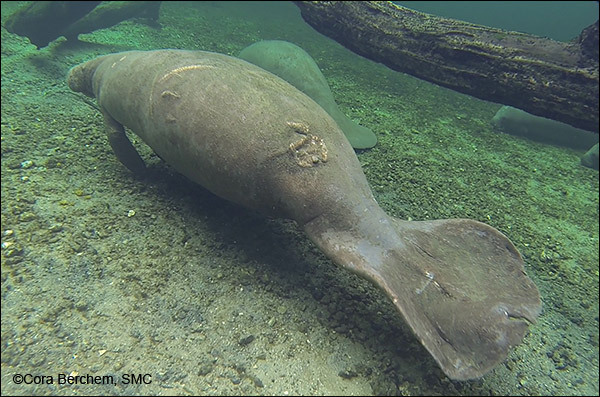 These manatees have a known history because they have been followed over the years by researchers from the Florida Fish and Wildlife Conservation Commission. 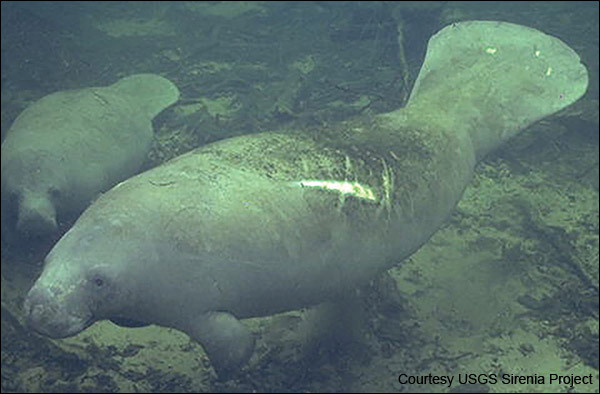 Several of these manatees winter at the warm water discharge area of Tampa Electric Company’s (TECO) Big Bend Power Station. Chessie the manatee is spotted in the Chesapeake Bay in Calvert County, Maryland on July 12, 2011. If you look closely, you can see the long, gray scar on his left side that helps to identify him. 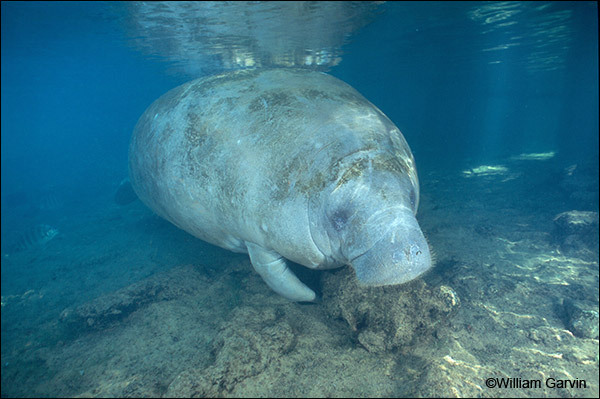 In the summer, when water temperatures are warmer, manatees travel freely around Florida’s rivers and coastal waters. 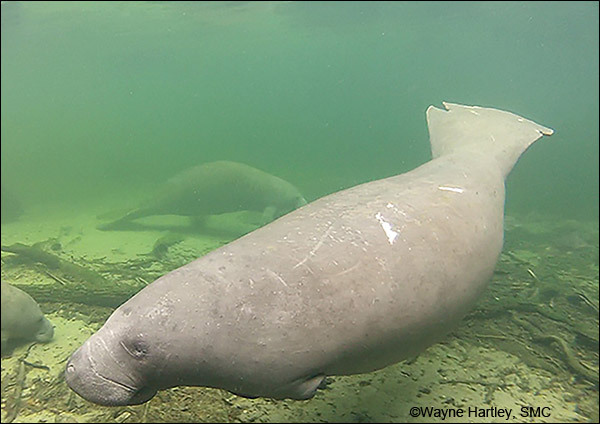 Some manatees travel outside of Florida, and one manatee gained fame when he was documented as having traveled to the northeastern part of the United States. 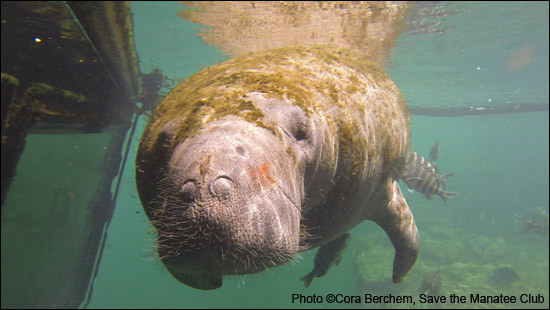 His name is Chessie, and his movements are followed by the U.S. Geological Survey’s Sirenia Project, an agency that tracks manatees along the U.S. East Coast. 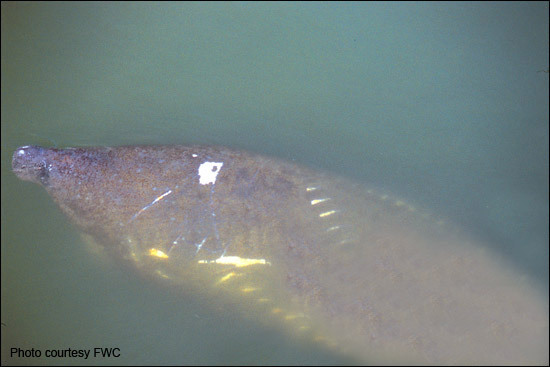 Bama made history in 2009 when she became the first manatee ever captured and tagged in Alabama waters. Summer sightings of manatees in Alabama, Georgia, and South Carolina are relatively common. 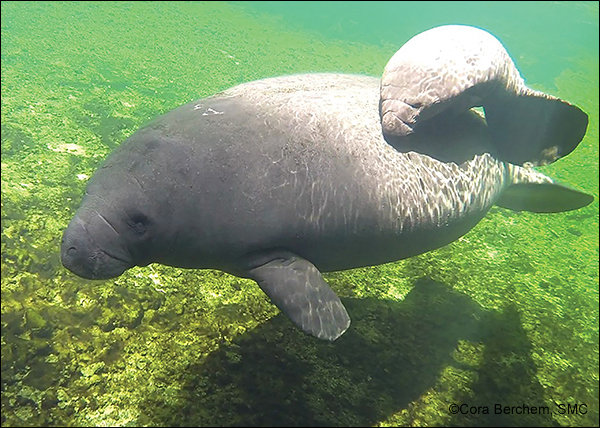 The most recent addition to Save the Manatee Club’s adoption program is named Bama, who has been sighted in Alabama waterways each year since 2009. 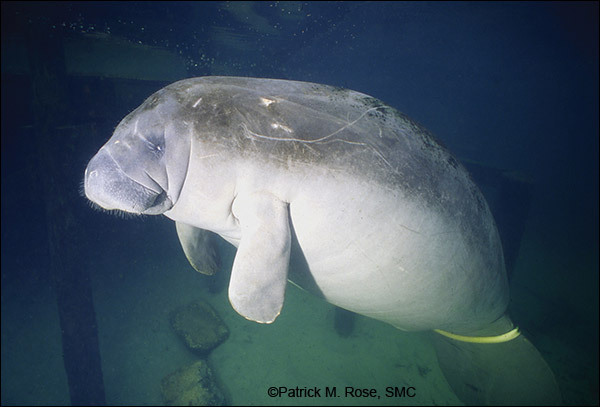 Bama is being tracked by Dauphin Island Sea Lab’s Manatee Sighting Network in Alabama. An adoption certificate, photo, and biography of “your” manatee. 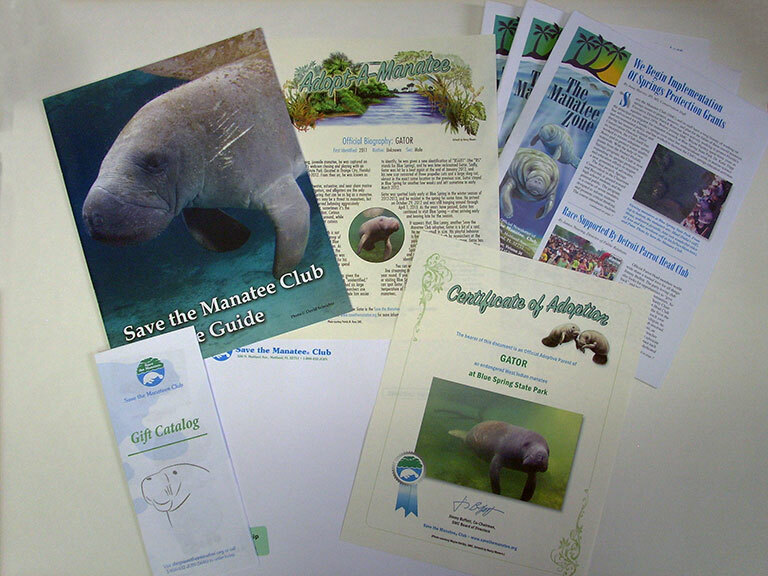 A 28-page membership handbook with information on manatees. 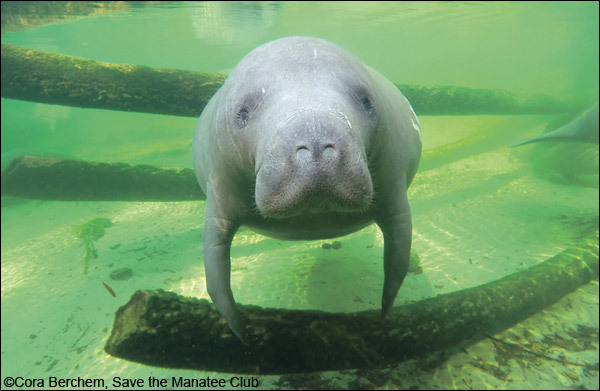 The Manatee Zone, Save the Manatee Club’s newsletter, which is sent four times a year. 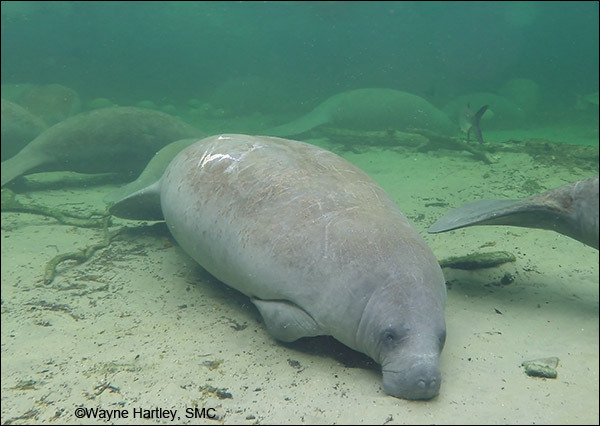 The newsletter features updates on manatees in the adoption program from manatee researchers. 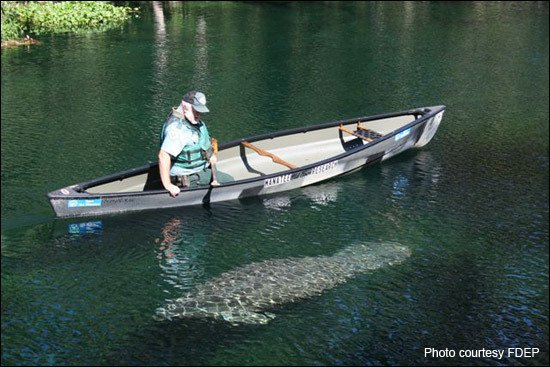 Paddle Tales, our bi-monthly eNewsletter, which includes current manatee news, great photos and video, manatee features, activities, and special offers and events. 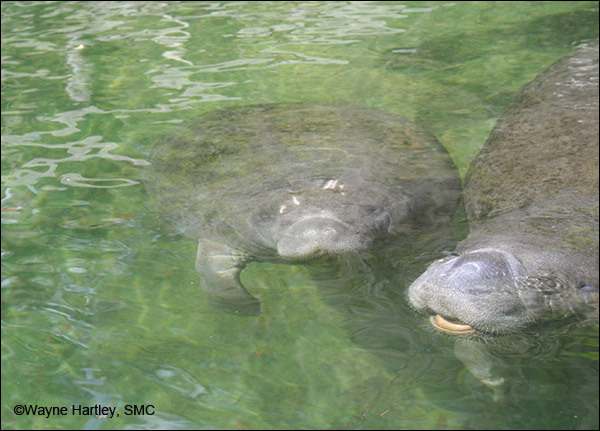 And, we’ll answer your questions about manatees. Your Membership Gift free with memberships at the Friend Level or above. Note: All amounts in U.S. dollars. An additional $10 will be added to adoptions mailed to all countries outside the United States. A four-color “Sirenians of the World” poster. An 8-page coloring and activity book (for elementary educators). Paddle Tales, the monthly eNewsletter. 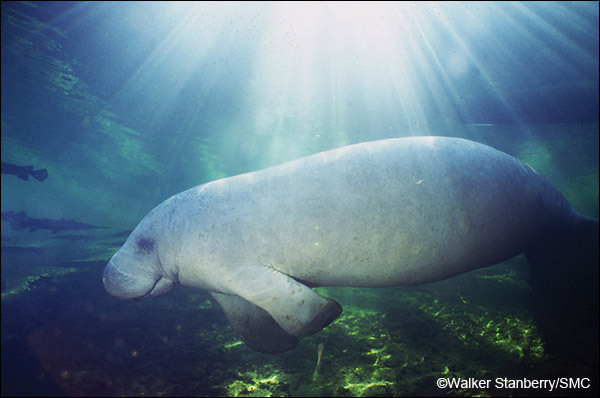 You can also become a grass roots activist for manatees and join volunteer efforts to help protect them! Get more information on our activities and programs. 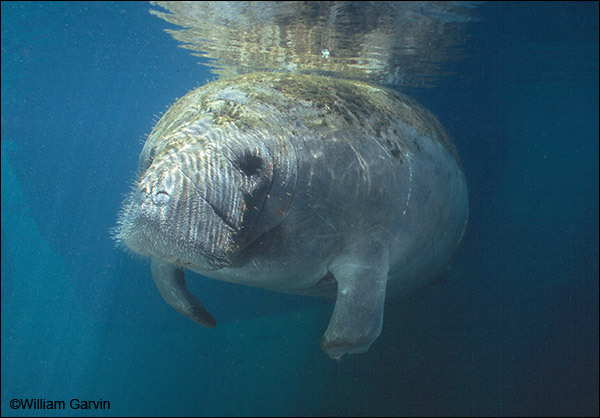 Send us an email at membership@savethemanatee.org or call us toll free at 1-800-432-JOIN (5646).